Seven games into the season, Nebraska football fans have taken a good look at the roster and have an idea of the team’s most valuable players. Some are established stars, some are newcomers making a name for themselves, and others are unexpected contributors. But here are five Cornhuskers who are staking a claim as this year’s MVP, along with those players’ odds of actually getting that accolade at the end of the year. I know, I know, he’s a punter. But hear me out. Field position is a huge, and frequently ignored, factor in winning football games. And in games where Nebraska has struggled, Foltz’s punting has gone a long way towards keeping Nebraska in the game. Take McNeese State for example. 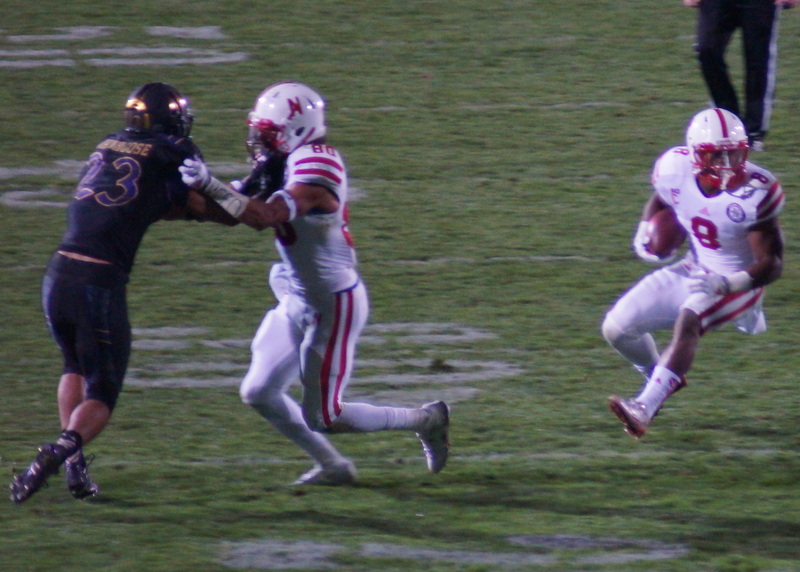 In the second half, as Nebraska labored to beat the FCS Cowboys, NU had to punt five times. The Cowboys’ starting field position after those punts? Their own 22, own 2, own 33, own 5, and own 10. Those are long fields, which made it harder for the Cowboys to score and put a real scare into Nebraska. Foltz did the same against Michigan State, as Nebraska punted seven (!) times in the first half. The Spartans’ starting field position was their own 20, own 20, own 13, Nebraska 31, own 19, own 16, and own 23. Other than one big return, the Spartans had a long field to cover, making it harder for them to score. Had they not, Michigan State could well have been ahead at halftime far more than “just” 17-0, making Nebraska’s near-miracle comeback a non-entity. Foltz won’t be Nebraska’s MVP this year. But given his contributions, he should be in the conversation. It is hard to know just what to think of Armstrong. On the one hand, Armstrong has struggled to take the reins of Nebraska’s offense. His completion percentage of 53.5 percent is problematic, almost to the point of being a liability. And whether it is Armstrong’s decision-making or offensive game planning, he has not (at least prior to Northwestern) run the ball enough to take attention away from Ameer Abdullah. In essence, the argument against Armstrong would go, at best Nebraska is succeeding with Armstrong as a passenger—and at worst, in spite of Armstrong. But the fact remains that Nebraska is 13-2 with Armstrong as a starter, and both of those losses came to Michigan State. And while “he’s young” falls a little flat as a defense of a quarterback with 15 starts, it is fair to say that Armstrong is improving. His completion percentage against Northwestern (62.1) may be signs of things to come. And the toughness and leadership he’s shown at the end of games, leading Nebraska to a near-Lazarus moment in East Lansing and helping to put a pesky Northwestern team away in the second half, certainly suggests Armstrong’s intangibles are critical to NU’s toughness and resiliency. Can a guy who touches the ball less than 15 times in a game truly be a difference-maker? True freshman Pierson-El may be providing us an answer. After his coming out party against Fresno State, Pierson-El’s electric punt return game has turned a huge liability for Nebraska into a huge asset. Pierson-El’s punt return against Michigan State was the crucial element in Nebraska’s oh-so-close comeback. And the fear of Pierson-El led Northwestern to kick away from him on punts—and even kickoffs—ceding field position to Nebraska without any risk of turnover or injury. And now Pierson-El’s role on offense is growing, including a reprise of the Black 41 Flash Reverse where Pierson-El threw a touchdown to Armstrong last week. Given Nebraska’s struggles with injuries at receiver, combined with Pierson-El’s playmaking ability (and, at least to Northwestern head coach Pat Fitzgerald, his ability to intimidate), he could end up making a remarkable difference. Gregory has missed nearly two full games out of seven for Nebraska. He draws cut blocks and ends up being taken out many times. Fair questions can be raised about his motor and ability to give maximum effort throughout a game. And yet Gregory, with his combination of size and speed, is the most disruptive defensive force Nebraska has seen since Ndamukong Suh. He has six tackles for loss and 4.5 sacks this season, even after missing nearly two of the seven contests. He can chase down opposing ball carriers from the back side of a play. He can, almost single-handedly, collapse his side of an offensive line. Nebraska’s defensive line as a whole has performed well this season. But at least some of the credit to that performance has to be the extra attention a weapon like Gregory gets from opposing game plans. It would be tempting to be a contrarian and try to find a way not to pick Abdullah. After all, Abdullah was a non-factor against Michigan State, with only 45 yards of rushing. He had gaudy numbers against Northwestern (146 yards rushing and four touchdowns), but almost all of that came in the second half against an overmatched defense. Even against McNeese State, Abdullah was held to just 54 yards rushing and one touchdown. But he had a receiving touchdown at the end of the game against the Cowboys, too, and that one was pretty good. That play single-handedly saved Nebraska from the prospect of overtime against an FCS team, and the possibility of a hugely embarrassing home loss. It was reminiscent of Abdullah’s fourth down conversion against Northwestern in 2013 which set up the Hail Mary victory. That run by Abdullah, I will maintain, is the most impressive demonstration of individual brilliance I have ever seen on a football field. Yeah, Abdullah has been held quiet when Nebraska struggles. But in some ways, that’s the definition of a team’s most valuable player. So with five weeks left to go in the season, Abdullah is the odds-on favorite to be the 2014 team MVP. ← Nebraska Football: Will the Cornhuskers Suffer an Upset Before Wisconsin?